B. Sc with CBZ or any other equivalent degree like Biotechnology/ Microbiology/ Biochemistry/ Genetics/ Industrial Microbiology/ MLT with 50% marks in aggregate. 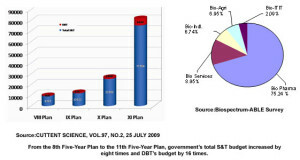 Molecular biology, molecular genetics, biochemical and analytical techniques, biochemistry, bio-mathematics, biostatistics and computer applications, immunology, hybridoma technology, radio isotope technology, microbiology, enzymology and protein engineering, cell and tissue culture, recombinant DNA technology, genomics, pharmaceutical biotechnology and drug designing. Dissertation involving 12 to 20 weeks laboratory work in the related field. The field in Biotechnology represents one of the frontiers of science. Biotechnology is a synergy of biological, chemical and physical sciences along with information technology. It draws on the applied life sciences (genetics, microbiology, animal cell culture, molecular biology, biochemistry, embryology, cell biology etc.). It also includes chemical engineering, bioprocess engineering, information technology and nanotechnology. Biotechnology has most emerging carrier opportunities in India as well as abroad. It has wide variety of career opportunities both in research and industry ranging from sales and marketing, research and development to manufacturing, quality control and quality assurance, teaching, science writing and communication and self employment.